With knowledge panels becoming increasingly informative, Google has now announced and released a new feature called ‘Posts’. Posts allows businesses to post news, promotions and events directly onto their Google Business listing. This is something that we’ve already started using at Anicca and there’s plenty we already love about it! Your updates appear on both desktop and mobile devices, and on a mobile device in particular they are a very prominent feature. Posts can be created through your My Business profile and once published will appear onto your listing in the search results instantly. You are free to publish whatever updates you want, include images and a choice of buttons including buttons to buy a product, sign up to newsletters or events, reserve products or get special offers. 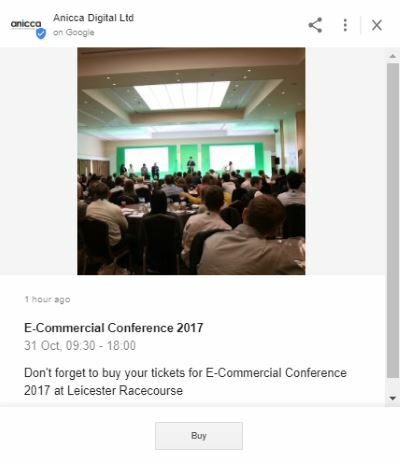 These can link through to any website you want, it doesn’t even have to go to your own website, so if you’re promoting an event, you can link directly to the ticket outlet. There’s also no need to worry about not being able to track how many people are using it if you link to an external site as there are insights available. You can also make your Post an ‘event’ where you’ll be able to add the event date and start time as well as some general information about the event. So, as you can see, it looks like the new feature is going to be incredibly valuable to local businesses moving forward and allows users to find information or promotions before they even make it to your website. What do you think of the new feature? Are you going to be using it for your business? We’ve got plenty of ideas for our clients that we’ll be getting in motion as soon as possible!